Your deck can be so much more than a place to go outside and cook and eat. Independence day has come and gone and summer is really heating up here on the East Coast. The sun is out long after you get home from work and even after the sun goes down, the nights are still pleasantly warm. Chances are that by now, you’ve already spent some time out on the deck this summer. Patio furniture is out and you’ve already fired up the grill a few times. Your deck can be so much more than a place to go outside and cook and eat. Here are some tips for turning your deck into your outdoor living space. Once upon a time, just having a deck would be a major selling point for homes. Now, simply having a deck isn’t always enough. More and more people are looking for comfortable, functional outdoor rooms. Perhaps you’d like to put up a ceiling fan, which will keep the bugs away and keep air moving on those still, hot days. Or maybe you’re looking to totally re-do everything and install an outdoor kitchen, these are becoming increasingly more common and can really increase your home’s value. 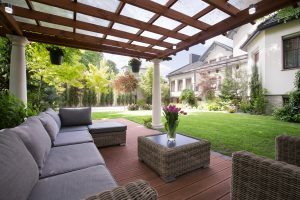 It is common to see homeowners who have decided to match interior flooring with outdoor decking to create a seamless transition from inside to outside. If you’d like to improve your outdoor space but don’t have a huge improvement budget, that’s totally fine! Something as simple as an outdoor rug can transform your deck. These are made with fibers and fabrics that are water and stain resistant. They are also coated to prevent sun damage. A freestanding umbrella or canopy can add shade and style; just make sure they are properly secured for those summer storms. A new grill can also really liven up your deck. They now come in many different models, shapes, sizes, and types than ever before so it’s simple to find the perfect grill for you. Ready to take your deck to the next level? Mid-Atlantic Deck & Fence is here to help! Mid-Atlantic Deck and Fence offers many different styles of standard fencing and decking, as well as custom-built designs to choose from. We are also one of Maryland’s only manufacturers and installers of vinyl fencing. If you have any questions about decking in Baltimore, please contact Mid-Atlantic Deck & Fence (MAD Fence) today by clicking here or calling 1-800-833-9310.